The Abyss awaits! When the city of Kenabres is destroyed by a horde of demons, only you can save the world! In Wrath of the Righteous, the epic new Adventure Path for the Pathfinder Adventure Card Game, you will travel to the Abyss to battle the malevolent minions of the demon lord Deskari. Along the way, you’ll become mythic heroes that rival the greatest legends the world of Golarion has ever known. 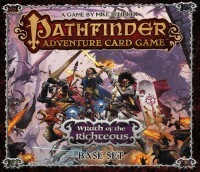 The saga begins in the Pathfinder Adventure Card Game: Wrath of the Righteous Base Set. This cooperative strategy card game lets 1 to 4 players enter the hellish Worldwound. Choose from 7 characters, each with a different style of play. Build a deck of powerful boons which will grow according to your desires as you advance in power by conquering challenges. Eventually, you’ll gain a mythic card, which will allow you to warp the rules of the game and use the first-ever 20-sided die to appear in a Pathfinder Adventure Card Game release. More than 500 cards featuring a new set of boons for your characters to collect, and never before seen monsters and barriers of a decidedly abyssal nature. 7 character classes, including the all-new arcanist, cavalier, inquisitor, and summoner. The Worldwound Incursion Adventure Deck, a 110-card deck that begins the Wrath of the Righteous Adventure Path. A complete set of 6 polyhedral dice, including the first d20 in the Pathfinder Adventure Card Game. Supplement your Wrath of the Righteous experience with the Character Add-On Deck and monthly Adventure Decks (sold separately). Time for the third installment of the Pathfinder Adventure Card game. Now it’s time to face the abyssal powers of Baphomet and Deskari, with some demonic flies tossed in as well. Wrath of the righteous is all about fighting the forces from the abyss until possibly facing Lord Deskari himself in one final, epic battle. Basically this is the same game as the previous two but with a different theme, so I there is not much point going through the rules again. I’d rather take a look at what changes have been implemented in this version (in addition to the change of theme). There are a couple of new ones, and quite a few you’ll recognize from previous adventures. What they have added to a few of them is a new type of card called cohorts which basically is a companion for a specific character and is a card you add to your hand after drawing your initial hand and actually giving you a +1 card in your opening hand. Some scenarios will also give the players a few cohorts to choose from for that scenario only and are returned to the box afterwards. They have lots of different abilities and every character should find a cohort which should be helpful in some aspects. This part was quite talked up before the release and is a major change. After completing AP1 each player will choose a mythic path card. These cards will improve two of your main attributes but with only 12 (2×6) to choose from not every combination will be present. At the start of a scenario you’ll start of with a number of mythic charges equal to the adventure deck number and the number of charges you have will be added to any check using that attribute. On top of that you can remove any number of charges and replace one of the highest dice with a D20 for each charge spent to really get that mythic feeling. There is quite an interesting choice to be made here. Are you gonna take a card that will improve your main stat or will you upgrade your second hand (or worse) stats? In our party we ended up with both, with me being the one who upgraded other stats. For me it came down to not having a card with my two most wanted stats at hand and from the fact that combat checks are those we’ve usually had the least problems with. There were quite a few complaints about the previous adventures were too easy and/or too samey. So, what have been done on that part? Well, while it’s still the same assemble the dice and make a roll against a difficulty number there have now been added a few things that are bound to spice it up. First of all there are a whole lot more “Before you act…” checks which at the very worst will disallow a spellcaster to cast spells or a fighter to use weapons, or even do enough damage to make you discard all your cards. There are also a lot of immunity on monsters and some very hard barriers, especially early on. Early on is a keyword here as the game is quite hard the first 2-3 adventure packs but from then on we’ve had much less trouble with the scenario to the extent that a couple of them have been downright boring. Still, some of the henchmen and villains have taken a lot of planning and calculation to take out and we’ve on several occasions been down to the very last blessing. If it hadn’t been for 2 of 3 characters having the opportunity to scout a location deck I’m sure we would have replayed a lot of the scenarios but thanks to those abilities we’ve so far managed to make it through on each adventure on first attempt. For anyone thinking about jumping into the Pathfinder games this would be my recommended start set. If you can get past the first beating you’ll likely to suffer it has a lot to like. Rise of the Runelords is quite repetitive, Skull & Shackles feels a little bit clumsy with the ship and loot mechanic. Wrath of the Righteous on the other hand feels like a complete coherent adventure with varied locations, tougher henchmen and villains and a story that should engage. Heck, there’s even an location aptly named Middle of Nowhere to which you may travel in this adventure, and what’s not to like about that. Add a Review for "Pathfinder Adventure Card Game: Wrath of the Righteous (Base Set)"